1. Heat 100 ml of the coconut milk in a small pan. 2. Stir constantly till it thickens and reduces by half. 4. Add the remaining coconut milk, sugar, chicken stock, fish sauce, lemongrass and lime zest. 5. Add the chicken pieces and mix well. 6. Bring to a boil and reduce flame to low. 7. Simmer for 3 minutes till the chicken is cooked. 8. Add the basil leaves. 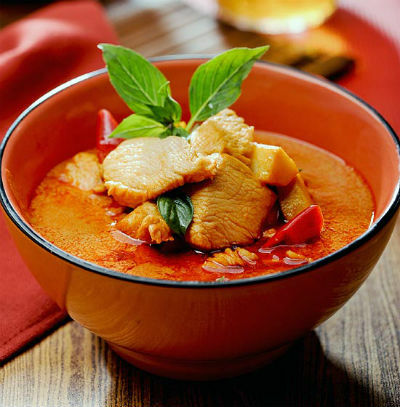 Feel free to comment or share your thoughts on this Red Curry Chicken Recipe from Awesome Cuisine.